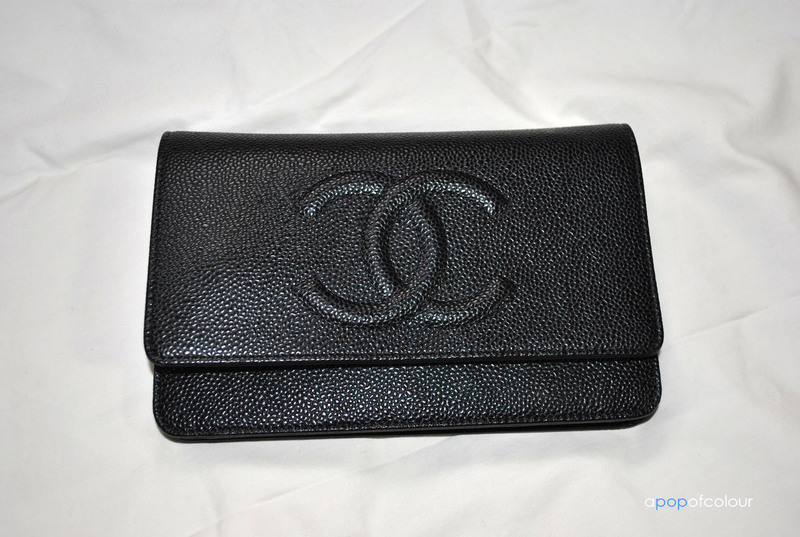 I originally wasn’t going to do a post on my Chanel Wallet on Chain (WOC) but I have had a bunch of requests on the topic and one of the most popular search terms to find my blog is something to do with the handbag. I was seriously debating on whether or not to do a post on this but it’s been requested a few times and truth be told, Chanel does not provide a ton of information on their website and really the only place to get up-to-date factual info is on the Purse Forum. Alright, so the Chanel WOC comes in a variety of different styles, colours, leathers, and price points. I’m not going to put prices on here, if you want to know current prices for WOCs check out the Purse Forum or please send me a message. The most inexpensive WOC is the Sevruga and the most expensive is the quilted (I believe and this is not including exotic leathers. This is based on permanent items in Chanel’s collection, not limited edition items). Other WOCs are the Camellia, Half Moon, Cambon, Reissue, and Timeless, which is the one I got. There may be a few more WOCs out there but I believe these are the ones that are in the permanent collection. 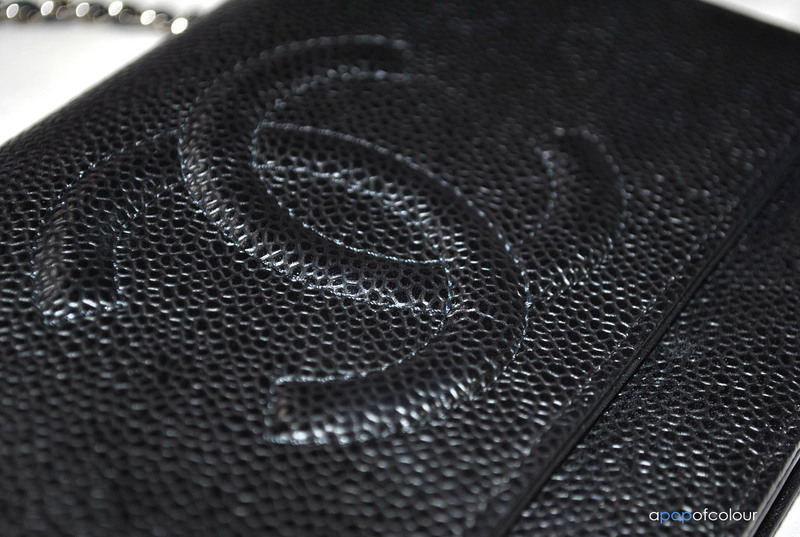 Now onto the leathers, Chanel has a variety of different leathers you can choose from. Some styles are only available in a certain kind of leather and others you can choose which leather is most suitable for you. Caviar Leather – This type of leather is the most durable and is more susceptible to wear and tear compared to lambskin. Caviar leather typically has little bumps and ridges as displayed below. Lambskin – Lambskin is a very delicate, smooth leather that shows scratches very easily. The Camellia and Quilted WOCs (Quilted is also available in caviar) are available in this leather. I chose to personally not get a lambskin WOC because I’m the kind of person who will spill cranberry juice on a white shirt. Stuff happens and I don’t want to constantly worry about ruining the leather on a very pricey handbag. I wanted to enjoy wearing the bag, not constantly worry about it to the point where it just stays in its box forever. Patent – The easiest way of describing patent leather is basically it’s shiny and feels like plastic rather than leather. 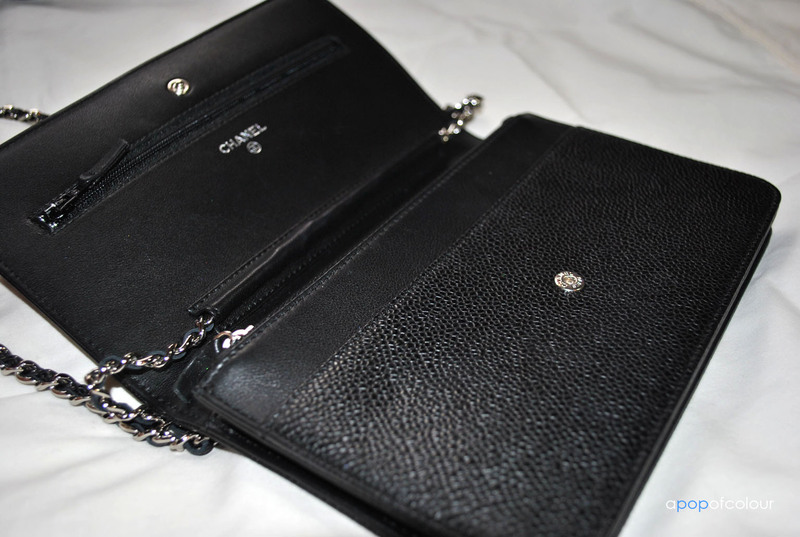 Whenever I see anything patent it’s always plastic, but in Chanel’s case, it’s leather. When it came down to the style I wanted it was between the Timeless and Brilliant (from the spring or summer 2011 collection I believe) which was the same as the Quilted but in patent leather (and the CCs are a bit bigger). I like the look of patent but I feel that it could be a seasonal thing; something that can go out of style. I preferred a bag that was essentially “timeless”, hence the name of the style I got. Other than the leather, Chanel bags usually come in either gold or silver hardware (aka the chain). All the WOCs I have seen have had silver hardware. I’ve never seen a gold one, unless it was a Petite Shopping Tote (PST), Grand Shopping Tote (GST), or the double flap, but those are different styles of bags altogether. Finally, WOCs come in a variety of colours, everything from the basic black, white, and cream, to hot pink, royal blue, green, etc. all depending on the season. 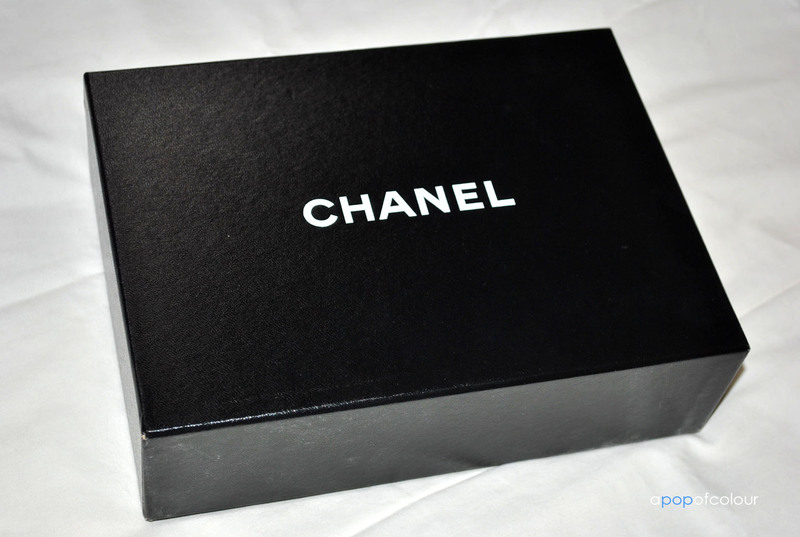 For my first Chanel (and probably my only one) I wanted basic black, a colour that is always in style. 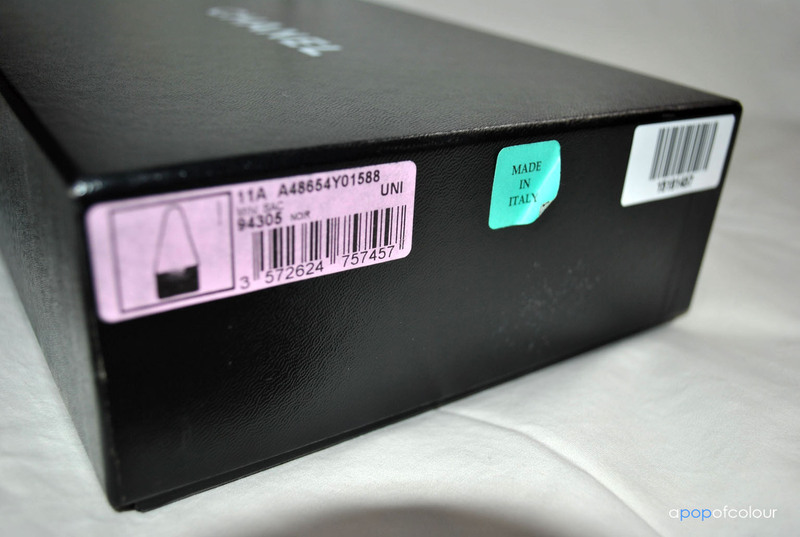 As with most Chanel items (if not all) they come in their own special box with the style number, where it’s made, and a barcode on the side. 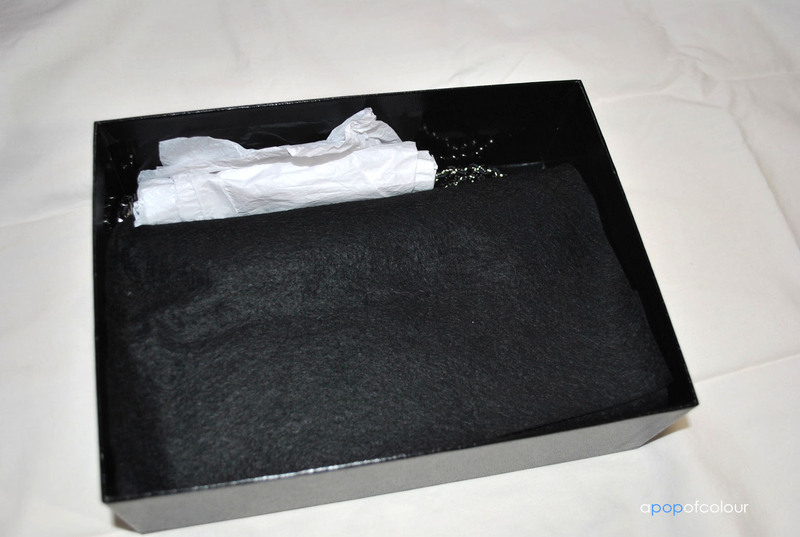 When you open the box, the WOC is wrapped in felt to protect it from dirt and dust. 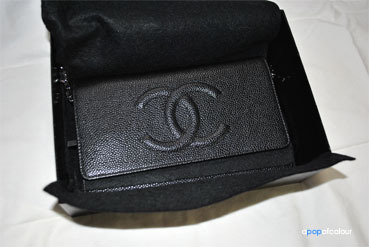 Unfortunately, Chanel does not provide a dust bag for small leather goods, which is such a rip off if you ask me. A dust bag costs Chanel, what, like a dollar, and for the price of these purses, you would think they could provide the dust bag. I tried to get one at the Chanel boutique at the Wynn but they said I would have to try Neiman Marcus because that’s where I bought the bag. I think they only make a certain amount of them so that they aren’t easy to get. Aside from that, the bag also comes with an authenticity card, an authenticity sticker somewhere on the bag, and information about the product in a variety of different languages. 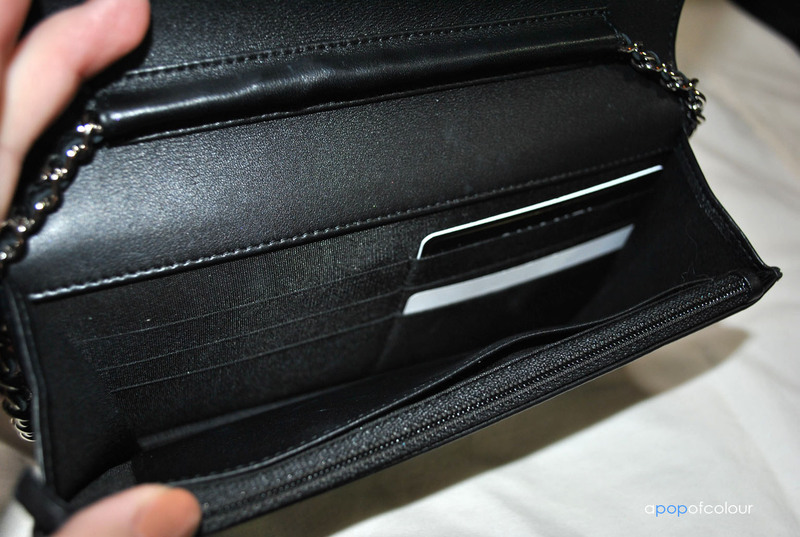 Once you open the felt there is also a piece of felt under the flap to protect the inside leather. 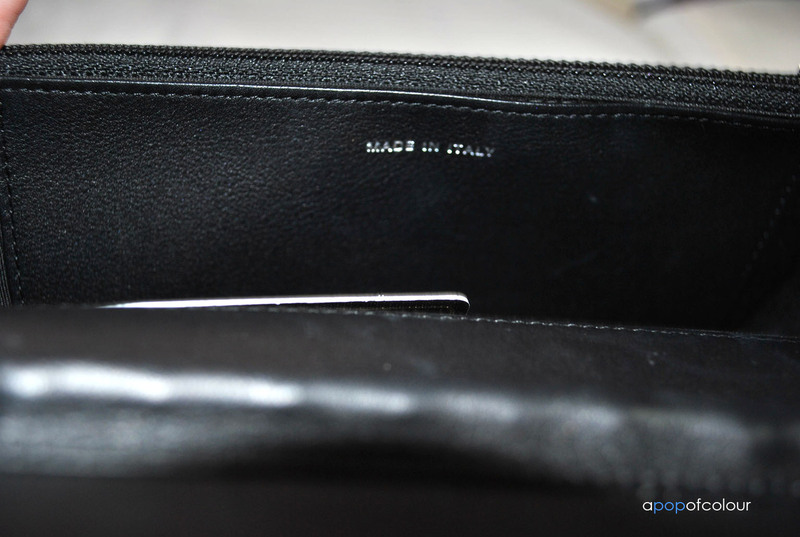 The Timeless WOC (like most of them) has a pocket on the front panel when you open it, a zipper pocket for change, another zippered pocket on the top of the inside flap (which is very deep, it reaches the bottom of the purse), and a pocket behind the zippered compartment. In addition to this, it also has six card slots. The back has no pockets unlike the older version of the Timeless which had a back pocket and a rounded flap (the new Timeless has a rectangular flap as seen on this blog). As for where it is made, mine was made in Italy, but others are made in France (I prefer France, but all they had were Italian-made bags). 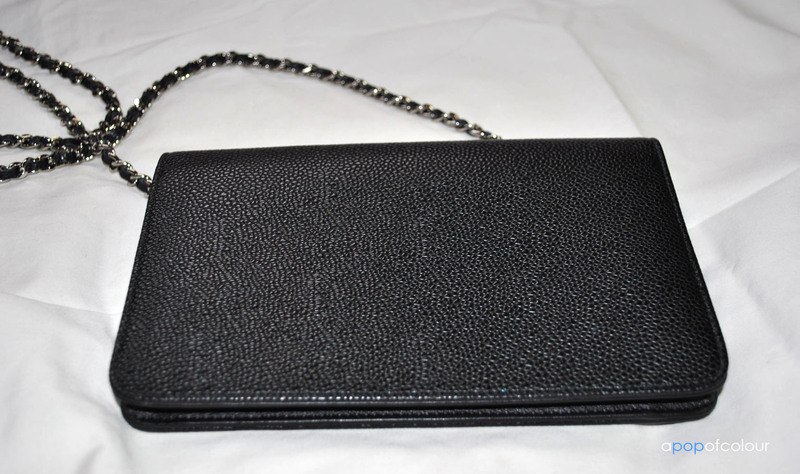 The bag itself measures 7.5 inches wide, five inches in height, 1.5 inches when it is expanded, and the chain drop is 24 inches. As for the chain, you can wear it a variety of different ways. You can rock it as a cross body or just hanging on your side, you can double the straps to wear it as a shoulder bag or you can tuck the straps in and wear it as a clutch. So how functional is this bag? Very! I can’t think of an instance where you couldn’t wear it. You can use it to run errands, when you want to be hands free, a special event, etc. I personally get sick of carrying a large, heavy handbag around with me all the time, it’s nice to have something small which carries the essentials. It may be a small bag but I can fit my iPhone, keys, car keys, lipstick, and money very comfortably in here. I purchased my bag from Neiman Marcus at Fashion Show Mall in Las Vegas. I actually called all the Chanel boutiques about 20 days before my trip and they said they were sold out of all the WOC styles and didn’t know if they would have any by the time I was in town. Feeling somewhat defeated, I tried Neiman Marcus as a last resort and they had all the styles there in stock. So basically I bought the bag ahead of time and then when I was in Vegas I just picked it up. I highly recommend that if you are travelling and plan on buying a bag while on vacation, call a few weeks ahead of time to see if they even have the bag in stock. It was the same kind of deal when I got my Louis Vuitton in Montreal, they were sold out of them and then got one literally the day I got there. Is there a big difference between buying Chanels at boutiques or department stores? Not really, it’s the same bag, however, if you buy it from a Chanel boutique you of course get all the fancy packaging. I have heard though that the exchange/refund policies are better at department stores so that is something to keep in mind. 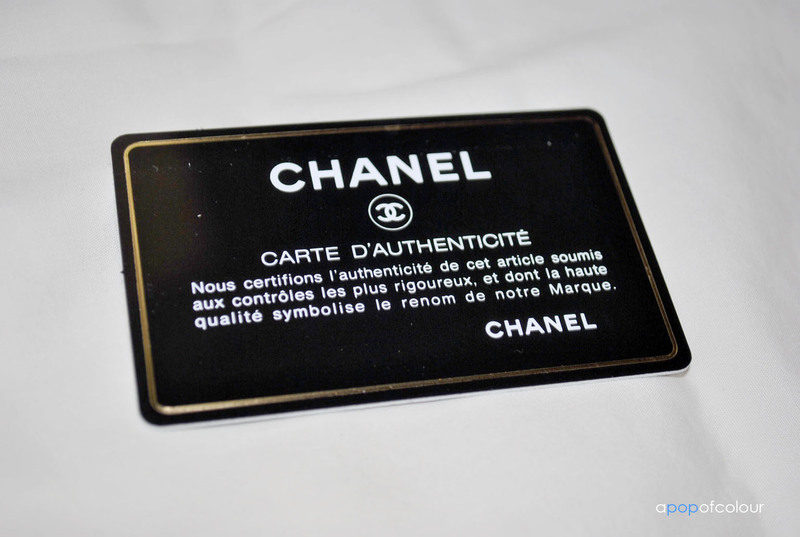 Also, once or twice a year Bloomingdales has 20 per cent or something like that if you sign up for a credit card and often in the past that has included Chanel, so keep your eyes and ears open for that if you are interested in a Chanel bag. I think there are three Bloomingdales that sell Chanel in the United States, check out their website for more information. Keep in mind that Chanel rarely goes on sale (the sale items are usually seasonal items that don’t sell, permanent items never go on sale). Instead of marking down their prices, Chanel increases them a few times a year, and I’m not talking about a couple bucks, I’m taking several hundreds of dollars. It’s crazy. Another tip I have is if you are travelling internationally, call to see what the price of the bag is in the country you are travelling to and see how much it is at home. In Canada, the Timeless WOC is actually cheaper by about $150 but the SA in Calgary said that they are sold out cross-country and it is so high in demand that they literally don’t have the leather to make more. She said they would probably have some by Christmas but I mean I thought by the time that rolls around the price may go up and besides I had the money for it for my trip to Vegas. I literally saved up the whole summer to purchase this item. Another tip, if you are travelling internationally (especially in European countries) make sure you get your VAT tax back, all you have to do is ask for a form and then a few weeks or months later you can actually get the tax back. It’s the same thing for some States as well, unfortunately not so for Nevada. 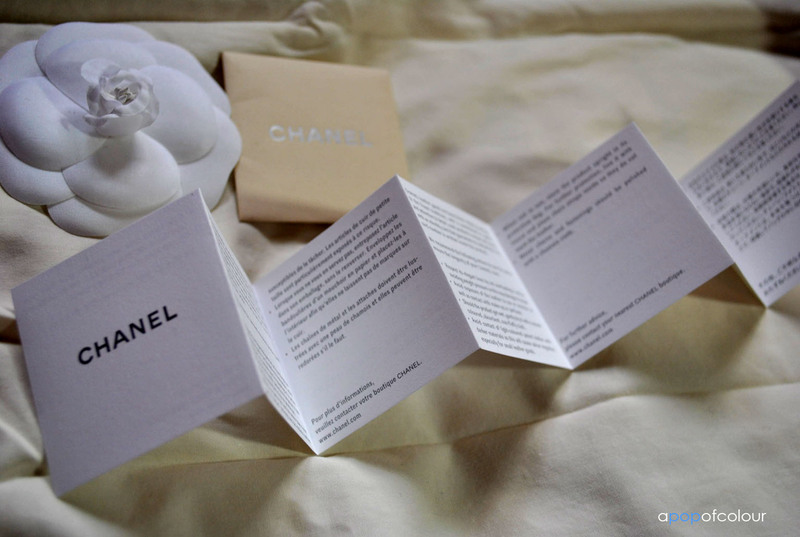 Anyways, I hope you enjoyed all the information on the Chanel WOC. If you have any other questions please send a message or comment below. I did a ton of research on the product before I bought it and unfortunately Chanel is very tight-lipped about their products online and when you call the stores, well you can get a very uninformed SA or just someone who is too busy to talk. 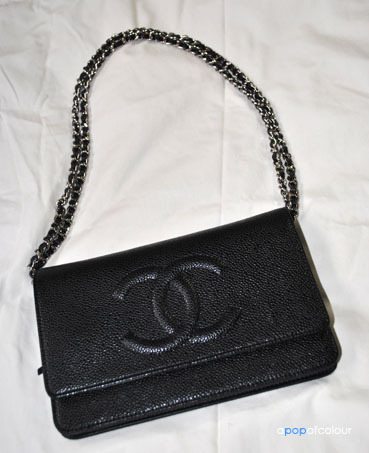 There are a few blogs out there that have photos and information but info on Chanel is very limited unless you go to the Purse Forum, which I highly recommend. Hey lovely, I’m going to Italy in December so I thought of getting WOC timeless too! Just wondering, how much did you get it for? Hi – I’m considering buying this woc, see link attached below. Do you know year this is from (I think 2011?) and how much it retailed for? I have seen this WOC in person at the Chanel in Holt Renfrew in Calgary last year. I don’t believe it retailed for $1799, maybe around the $1200-1400 range, however, that would be Canadian. If they still make this model I’m positive that it wouldn’t be as much as they are selling it for. Your best bet would be to call around and see if any Chanel’s have it, even if they don’t you can still ask if they currently make that model and how much it retails for. Hi, I really love your WOC. Do you know if the bag is large enough for keys, wallet and some cosmetics stuff? For sure! I can fit my iphone, keys, cards, and a lipstick, and still have some room left. 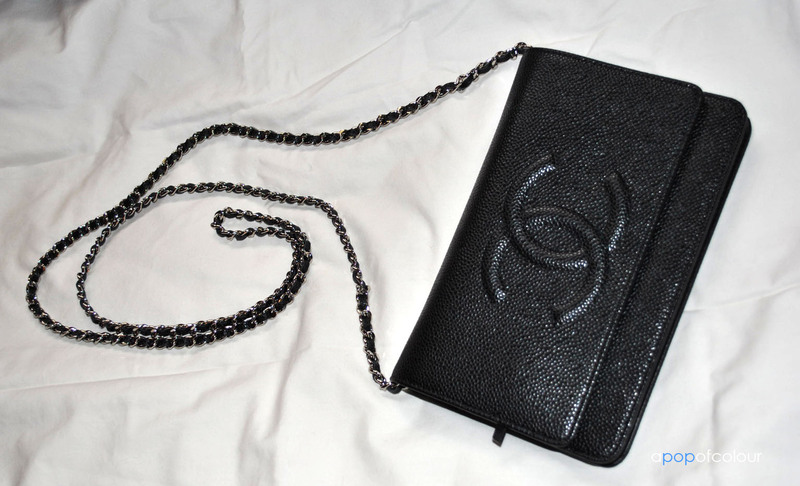 Chanel Willet on chain Woc that’s so lovely and smart really on this bag..